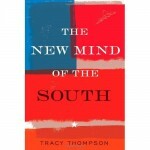 David speaks with Pulitzer Prize winning writer Tracy Thompson about her new book The New Mind of the South which explores the way the region has adapted and transformed itself. The book attempts to update W.J. Cash’s “The Mind of the South,” which has become the definitive non-fiction narrative of the South. Thompson’s book picks up where Cash’s leaves off in 1941 and describes the changing landscape in the South after WWII caused by immigration, integration, and politics.